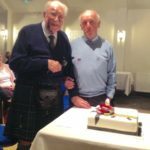 Chairman Niall Iain MacLean welcomed a full house at the Inveraray Inn for the November meeting of the Inveraray and District Accordion and Fiddle Club. 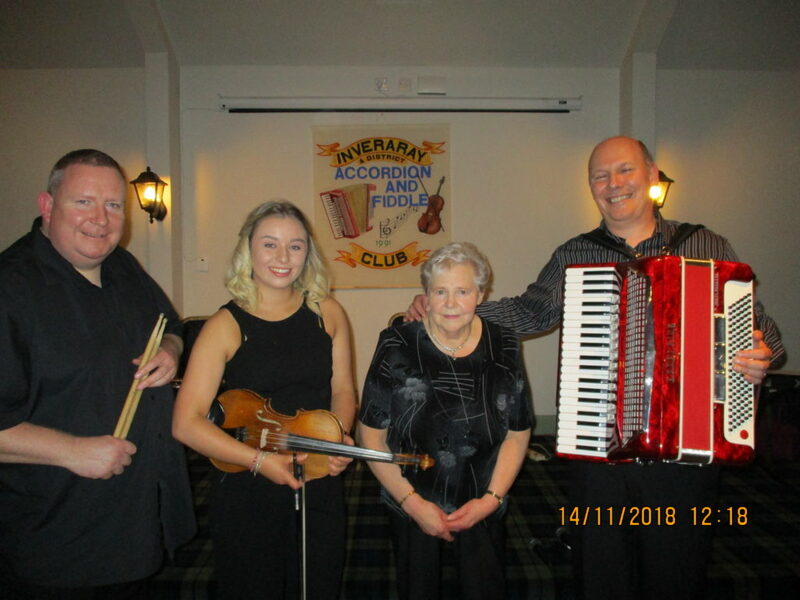 Supporting players were – Fyne Folk, with Jake MacKay on ‘moothie’, Sally Hall and Alex John MacLeod on fiddle and Agnes Liddell on keyboard; also playing were James MacArthur, melodeon; the Dalriada Ceilidh Band; Ishbel Fraser on ‘moothie’; Peter Stewart on accordion; Jimmy MacDonald on keyboard. Their varied selections were much enjoyed. The guest artists were the Addie Harper Quartet, who had made the long journey down from Wick. 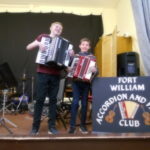 With Addie on accordion and steel guitar, his mother Isobel on keyboard, Emily Morrison on fiddle and Callum Wallace on drums, they delighted the audience with a great mixture of sets. Emily enthralled the crowd with her beautiful fiddle playing and it was hard to believe that she was only 18 years of age – definitely a star in the making. Callum also sang a couple of well-known songs. The chairman thanked Addie and the band for a superb night and also all the ‘local’ players for their contributions. Next week the club looks forward to the Donald MacLeod Trio from Drymen as guest artistes.